Govinda is a one man entertainment show. His real name is 'Govinda Ahuja' and his pet name is 'Chichi'. He is 5'8" and was born on 21st December, 1963. His father Arun Kumar Ahuja was a producer, mother Nirmala Devi was a singer and his brother Kirti Kumar is Producer, director, actor. He is got married to Suneeta and have two children. 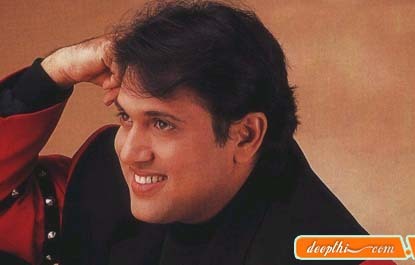 Govinda started his film career with Illzam in 1986 but was recognized as an actor from Hathya. But again his profile goes to low and then the shift however came with David Dhawan's Aankhein which was the block buster hit of the year. Govinda's image went for a complete overhaul. Almost all the movies that he teamed up with director David Dhawan were box-office hits. Dancing talents were already embbed in him, but improvement in acting and his efforts to streamline his physical appearance has made him Number 1. Govinda's comic roles took him to the heart of many hindi movie lovers. Govinda got 'Lux Zee Cine Award' in 1998 for 'Best Actor' in a Comedian role for Dulhe Raja, 'Special Filmfare Award' in 1997 for Saajan Chale Sasural, 'Special Videocon Screen Award' in 1998 from Jury for overall performance. In 2004 he has enter into politics and stand by the side of Congress. He has won in West Mumbai against Ram Jaithe Malani. But he will not quit from movie. He has gone out of his way to find ways and means to get his near and dear ones into films. He also helps all those he believes deserve help.The masses love him because they indentify with him. Ssukh ( Govinda, Preeti Jhangiani, Aarti Chhabria, Chunky Pandey), Ek Aur Ek Gyarah ( Govinda, Sanjay Dutt, Jackie Shroff), Wah Tera Kya Kehna ( Govinda, Raveena Tandon, Shakti Kapoor, Mohnish Behl), Akhiyon Se Goli Maare ( Govinda, Raveena Tandon), Pyaar Diwana Hota Hai ( Govinda, Rani Mukherjee), Aamdani Atthani Kharcha Rupaiya ( Govinda, Juhi Chawla, Chandrachur Singh, Tabu), Shikari ( Govinda, Karisma Kapoor, Gulshan Grover, Paresh Rawal), Kyonki Main Jhoot Nahin Bolta ( Govinda, Sushmita Sen, Sharad Kapoor, Satish Kaushik), Albela ( Govinda, Aishwarya Rai, Jackie Shroff), Jodi No: 1 ( Govinda, Sanjay Dutt, Twinkle Khanna), Kunwara ( Govinda, Urmila Matondkar, Johnny Lever), Hum Tum Pe Marte Hain ( Govinda, Urmila Matondkar, Dimple Kapadia, Nirmal Pandey), Haseena Maan Jayegi ( Govinda, Sanjay Dutt, Karisma Kapoor, Pooja Batra, Kader Khan, Anupam Kher), Had Kar Di Apne ( Govinda, Rani Mukherjee), Joru Ka Gulam ( Govinda, Twinkle Khanna, Kader Khan, Johnny Lever, Ashok Saraf).